THAT Santa gets about, doesn't he? One minute he's zipping around the world delivering presents, the next he's cleaning windows on a Coast high-rise - all four of him. 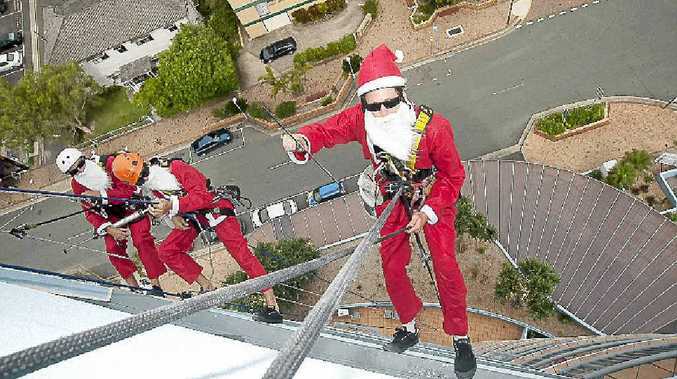 The jolly old bloke and a few of his mates were suspended high above the streets of Caloundra as they did some cleaning and maintenance work on the Centrepoint building in time for Christmas. Jason Dobinson, the owner of Sunshine Coast-based business All-Tech Industrial Abseilers, said working 14 floors up was nothing new for him and his staff, who spent a lot of time dangling from some of the Gold Coast's highest buildings. The Santa suits were "all about the kids", he said. "It's just our way of saying merry Christmas." And just for the record boys and girls - no, Santa and his helpers do not get scared up so high because they have magical powers (and very strong ropes). And, yes, the view is spectacular but sometimes they see things through the windows that maybe they should not. Thankfully, Santa is very good at keeping secrets.